The camera developed by a research team from the University of Stuttgart isn’t to be taken with a grain of salt — because it’s actually smaller than that. Using 3D printing, a group of PhD students recently created optics small enough to fit inside of a syringe at just .12 millimeters wide. Current manufacturing techniques make it impossible to construct tiny lenses, the team said, but by using 3D printing, also known as additive manufacturing, the size possibilities change dramatically. 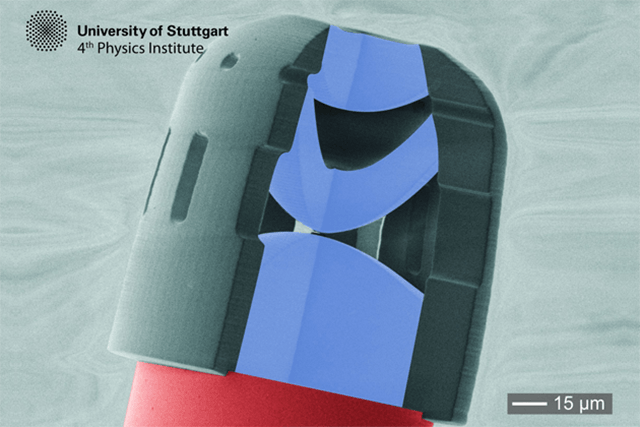 The team, led by PhD students Timo Gissibl and Simon Thiele, said that the process of designing and manufacturing the tiny lens actually only took a few hours. While getting one lens into a device that small seems like a feat in itself, the device actually encompasses three lenses and is attached to a five-foot optical fiber that’s only about twice as wide as a strand of hair. That optical fiber should allow the camera to be injected into the body, relaying information back to doctors for diagnostics, and should also enable the inspection of machinery. Of course, there’s no light inside the human body, so the camera is paired with a tiny LED. The research team also printed a version with a more traditional image sensor, creating a very small camera with a number of different uses — perhaps as a very tiny spy cam or to equip other tech, such as robots, with “vision” of their own. The tech could make it possible to equip drones the size of bumblebees with cameras or give smartphones a 360-degree surround camera system, the university suggests.